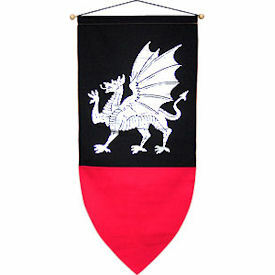 The dragon of Wales is emblazoned in glistening silver on the black background of this heraldic banner, which is accented by a bright red bottom panel. Add a touch of royal Celtic decor to your palace! 48" high x 22-1/2" wide. Includes kit for hanging.